We all have so much magic and power in us. Over the years, some of us have forgotten it. Or disconnected from it. Or lost faith in it. 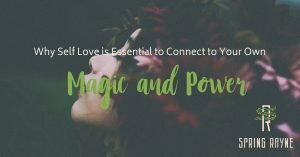 The first essential ingredient you need to connect you to your own magic and power is self love. People have asked me why I shifted gears – from raw, vegan food, to the love your body language, to intuitive/healer magic and power. It may look like my messaging is all over the map, but the truth is it’s all interconnected. At the core of it all is self-love. LOVE YOUR BODY BECAUSE IT TRULY IS A TEMPLE – THE VEHICLE FOR YOUR SOUL TO EXPERIENCE THIS LIFETIME. As your temple, it’s also your tool and your guidance system. You’re a binary consciousness. Your body has a consciousness of its own and when you tune in to it, you can listen to your body to get messages from beyond your five senses and access far more information. For some, this comes as a gut feeling. You literally sense information coming in from the gut – like a rising or falling feeling. Or a moving towards or away from something. For others, it may come in through the heart. The key is to honor and love your body as a vehicle and as a wondrous machine that provides access to other worldly and extra sensory information. If your hating on your body, self-shaming or judging yourself, it’s really hard to live in that space of self-honoring and tuning in. LOVE YOUR WHOLE AND HIGHER SELF BECAUSE YOU’RE SO MUCH MORE THAN YOUR BODY – YOU’RE A MULTI-DIMENSIONAL BEING. You’re being is huge – you’re a whole universe. That’s critical to understand if you’re going to connect to the all-powerful, magical part of yourself. You are a spark of the divine – a child of God or the Universe or Source or the All. How can you not be perfection? How can you not love yourself? When you’re living and operating from the small self or the separate self, it’s easy to become fragmented and feel disconnected from your magic and power. When you remember and tune into the huge, expansive, multi-dimensional and limitless self, there is no more hiding and no more playing small. There is no option to live in denial about the magical, powerful part of yourself. But you must acknowledge that you are a powerful, magnificent, multi-dimensional being, totally and completely love yourself, and take time to connect to these higher aspects of yourself through meditation, contemplation, quiet time, time in nature or whatever works for you. SELF-LOVE FOSTERS SELF-TRUST, WHICH CONNECTS YOU TO INTUITION. Self-love creates security and safety within the self. It connects you to the higher aspects of the self as well as connects you to your body. Self-love helps you to be more attuned to messages from your higher self. And more attuned from messages that come through your body. Self-love not only attuned you to your higher self and intuition, it also helps you foster an intimate relationship with your higher self, building trust, which better connects you to your intuition. However your intuition comes in, self-love attunes you to hear it, trust it, listen to it and take the right action in alignment with it. You have so much magic and power in you. It doesn’t matter how long you’ve felt disconnected from it or how much you’ve lost faith in it, it’s there for you. And there’s nothing I’d like more than to show you how magical and powerful you really are. If you’re ready to take magic and power back in your life, own your truth and step into the highest expression of yourself, let’s talk. PreviousPrevious post:My Story (and why it might matter to you)NextNext post:What’s in the Stars for You in 2019 – Holiday Specials!